The bass guitar belongs to the stringed musical instruments. It has similar features with other types of guitars but distinguished by a significantly longer neck. The common bass guitars usually have four or six strings. It is played by strumming or plucking the strings. Bass guitars are very popular because they are fun to play professionally or as a hobby. The bass guitar was invented in the early 1930s by Paul Tutmarc. Learning how to play this musical instrument was previously restricted to physical classes in music schools. Now, through the use of innovative methods, more people can learn how to play the bass guitar online. These online lessons are mostly easy to access. 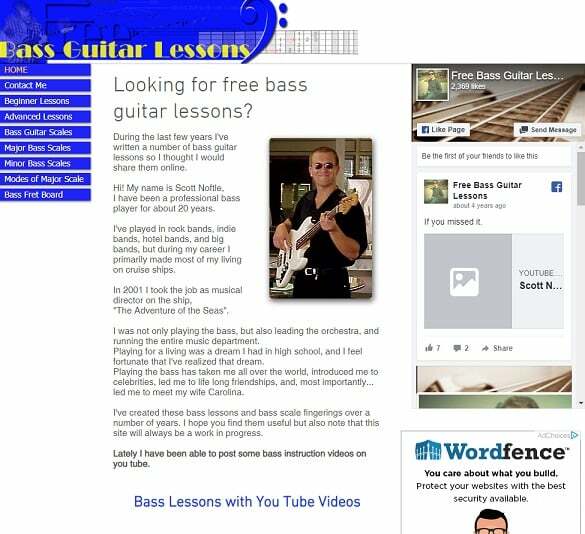 Some websites offer free bass guitar lessons while others are paid lessons. However, many of the online courses cover the basics that can help interested people get started and improve their skills. Artistworks offers paid bass guitar lessons to people who can learn from locations all over the world. The courses are personalized to help students create a convenient learning structure. This helps them understand the theoretical and practical aspects of bass guitar lessons. On the website, students have access to hundreds of learning materials after registration. The practical lessons are interactive. Students can record their practice sessions playing the bass guitar. These videos can be uploaded viewed and corrected by the instructors. The growing online community made up of beginners and intermediate bass guitarists is also a source of useful information through knowledge sharing. The online courses on artistworks for the bass guitar are categorized into a three month, six months and one year course. 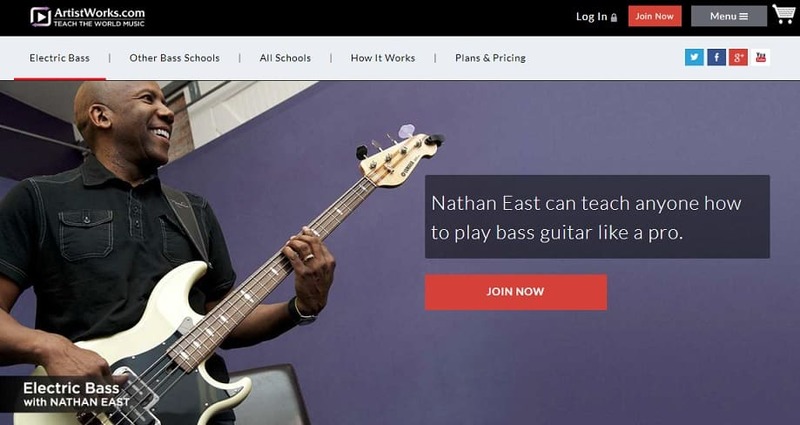 Nathan East is the lead instructor in charge of producing the online lessons. He is an experienced bass guitarist who has played alongside top musicians such as Barry White, Anita Baker, Quincy Jones, Michael Jackson, and many others. The website is easy to use, and the lessons are updated regularly. Students have access to the online music workshop; the monthly AW live broadcast and many more VIP privileges. Students can start classes at all levels, specifically the beginner, intermediate and advanced bass guitar online lessons. 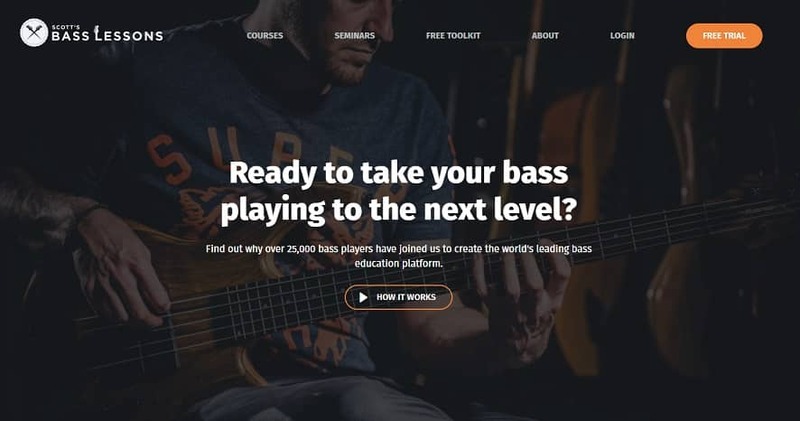 Udemy has created online learning opportunities for people interested in playing the bass guitar. On the website, the available lessons are tailored for all levels of students. There are over fifty online lessons to choose from on the site. You can find online instructors who have designed their lessons for people who need master class training and others at the beginner level. Depending on the students’ needs, courses that cover basic areas such as tuning the bass guitar, learning the different styles, understanding the scales and music theory are available. Some instructors have included structured courses that students can use to advance from the beginner level to advanced levels. The website is easy to use; students are offered money back guarantee if they do not get value after the lessons. It is easy to find the best bass guitar teachers on this website. To guide students, the instructors have created online profiles that portray what they can teach. Reading these profiles helps students to understand the value they will get after buying the lessons. The online teachers have also been graded based on a five-star rating system. This means students can buy lessons from instructors who have high ratings on the website. The online bass guitar lessons on JamPlay are presented as high-quality video tutorials. 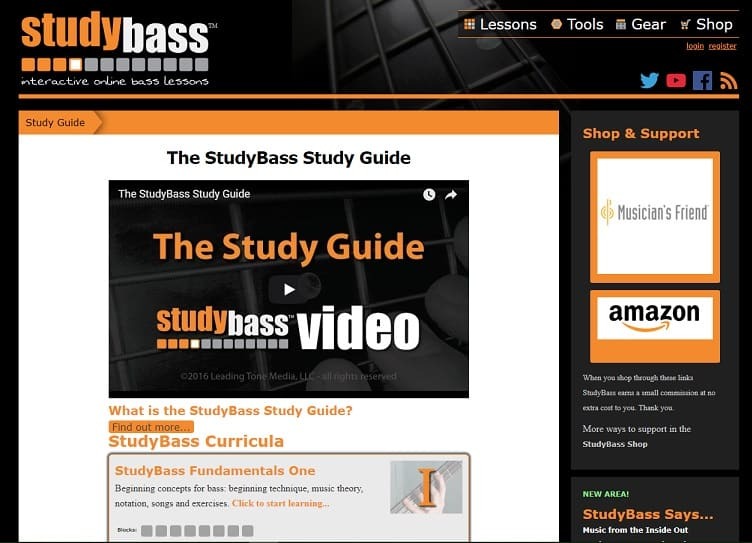 On the website, students also have access to useful information, tips, and hints to improve their bass guitar skills. The video lessons have been professionally recorded. This makes it easy for students to study and learn the different learning areas featured in the videos. Beginners and others who have some experience can start learning at any level. This is made easy because the lessons have been classified into four distinct categories. The website is enhanced for students who plan to receive lessons with their mobile devices or desktops. 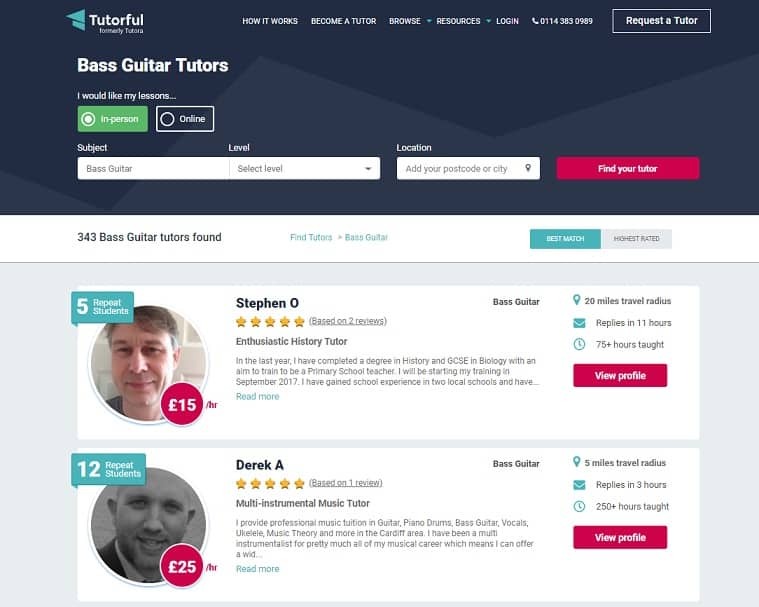 There are more than ten teachers who have created structured bass guitar lessons on the website. The teachers on this website have made it easy for students to make a selection. They all have personal profiles which indicate their areas of specialization. Reading these profiles helps the students to understand the lessons covered. The learning process is also improved with the inclusion of interactive TABS and notations. This helps with learning picking methods, strumming, managing play back speed and studying the tracks. During the course, students are given access to hundreds of learning materials. They are also provided customized progress reports to help improve their techniques. 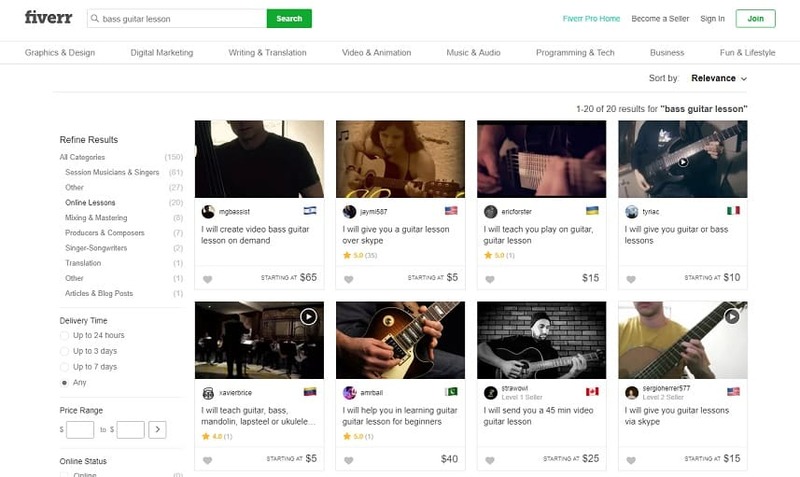 The online lessons on Fiverr cover the essential bass guitar techniques. The website accommodates so many bass guitar experts who are willing to offer their paid services. Everyone who needs to learn how to play or improve their bass guitar skills can find a teacher on this site. The paid lessons have different prices depending on what the teacher is offering. The lessons are mostly presented as pre-recorded videos. Some teachers offer private lessons which can be done live via Skype. 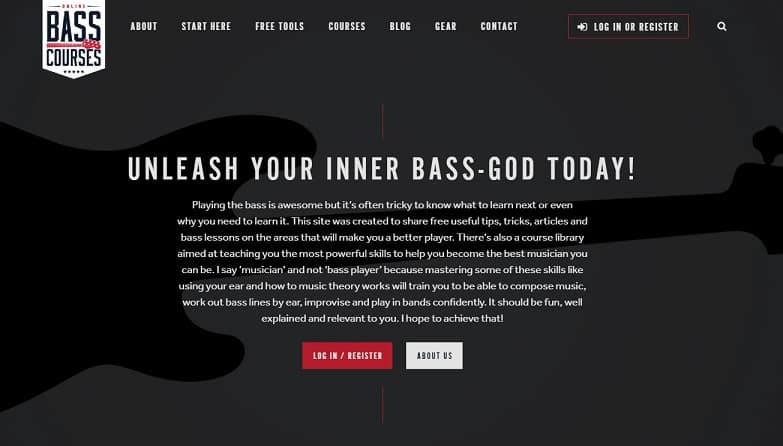 While some teachers offer lessons for all levels of students, you can also find teachers who have created their lessons for only intermediate bass guitar players. The teachers have not all been vetted by Fiverr, but you can view their reviews. This feedback reveals teachers who have been successfully helping other people learn bass guitar techniques. The lessons may last for a few minutes daily. There are some courses that cover all the areas the student needs to know. These one-time packages include instructions, pre-recorded videos, music theory, and tips to help students improve their techniques. Fiverr also makes it possible for teachers to indicate the language they speak. So, students from all over the world can select teachers from their home countries to have a more fluent interaction. The website is easy to use and secure. All the information needed to learn how to play the bass guitar can be obtained when the right gig is purchased. 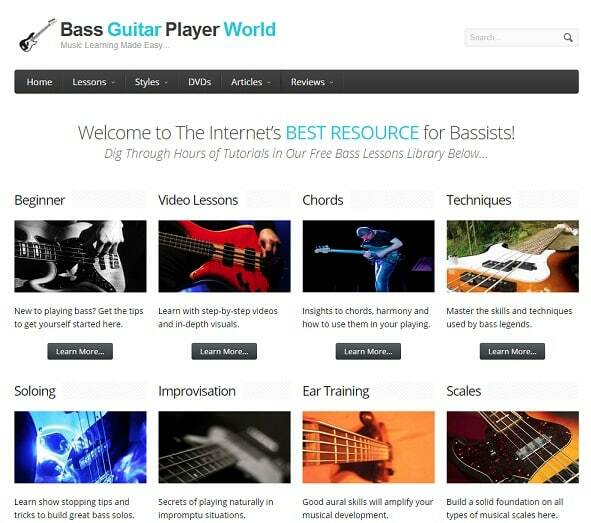 This website has been well structured to help visitors find the relevant information they need to learn how the bass guitar works. The lessons cover a wide scope. Students will have access to online lessons which can help them learn how to hold and play the bass guitar. Areas such as strumming, learning the notes, tuning the bass guitar and playing along with songs are extensively covered. 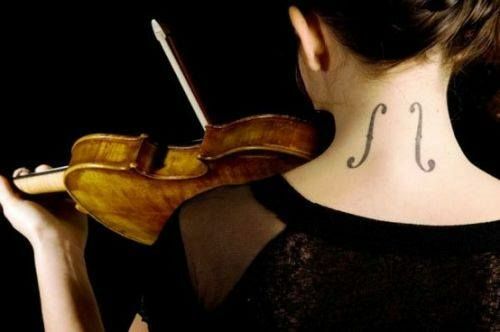 The advanced courses cover aspects such as the left-hand technique to fret, and the terminology. The website features pictures and HD videos that are easy to understand and apply. The paid online bass guitar lessons on this website also feature many tips and hints to help students. The content also features articles written about important topics related to playing the bass guitar. Students can learn a lot of information after reading articles on how to buy a bass guitar, learning the power chords, and the basics all beginners need to know. The online forum is another source of important information. The topics being discussed are frequently refreshed to keep the forum interesting and enlightening to all visitors. It is a good website, responsive and the video files are of high-quality. This website makes it easy for everyone to start their quest to become bass guitarists. It is easy because visitors can use the fourteen days free trial period to find out if the lessons are worth it. This free trial is accessible after signing up on the website. The offer can also be canceled any time. The lessons have been designed for bassists who are just learning or have had previous experiences with the bass guitar. The paid lessons give users access to over one hundred hours of learning resources. This includes video files, audio, and music theory. The simple website design features a preview for each course. 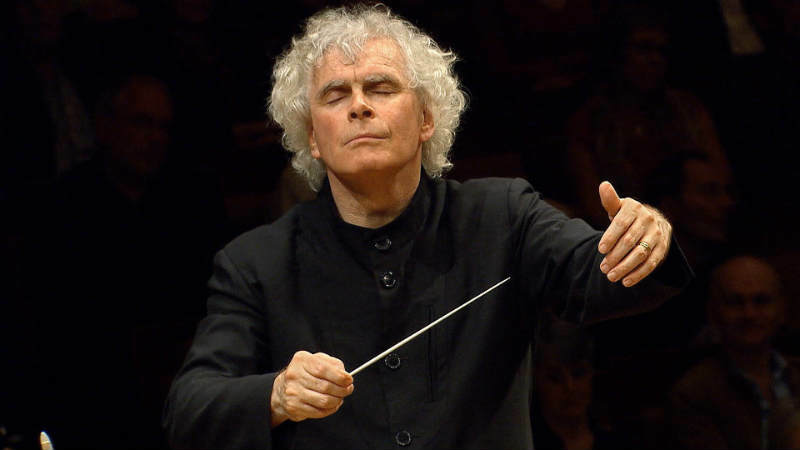 There is also a weekly master class organized as live sessions where participants get real-time feedback while practicing the techniques that have been learned. There are more than ten professional bass guitarists available during the master class. The website also features a timer that indicates when the next master class starts so everyone that is interested can participate. The website also supports a growing community where new participants can get support and more information from other members. The reviews on the site are encouraging, Scott Devine, the owner of the site, emphasizes his commitment to improving the interactive learning structure on the site which is also encouraging. The practical and theoretical online lessons on this website make it easy to become a better bass guitarist. The entire course duration lasts for many hours; however, the lessons have been divided into short sessions to make it convenient. On the website, students can follow a step by step procedure to learn everything about playing the bass guitar. There are lessons for beginners which include postural guidance, understanding the chords, notes and other areas such as tuning the bass guitar. The lessons are presented as pre-recorded videos made in HD. The high-quality visuals of the video lessons make it easy for students to study and practice using the videos. 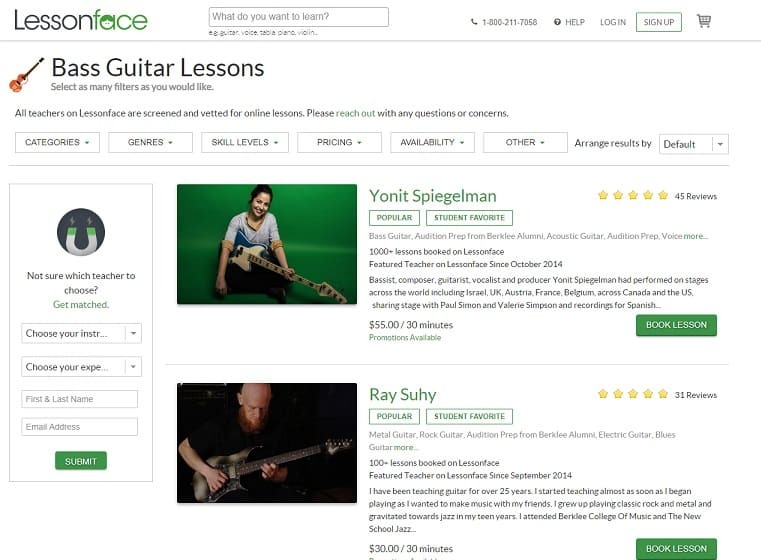 The teachers on this site state that the lessons are created according to special techniques used by renowned bass guitarists. The students are exposed to bass guitar lessons that teach soloing, playing by ear, and improvisation. The lessons also include non-traditional bass guitar techniques for people who are interested. First-time visitors to the website are offered a free EBook and a chance to sign up for the newsletter. The website is responsive so it can be used on mobile devices and desktops. This helps students achieve their dreams of becoming bass guitarists from the convenience of their homes. 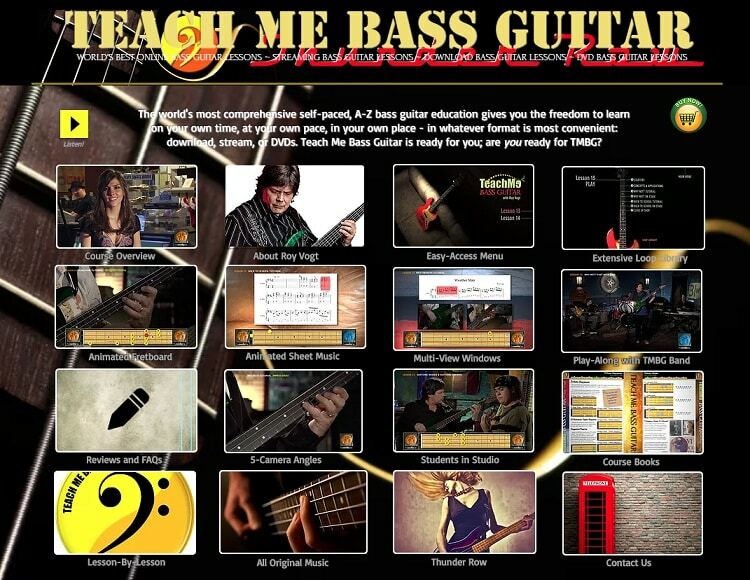 On this website, students can benefit from an interactive learning structure for the bass guitar. The program is created to combine online lessons, how to use tools, and several tips to help students become professional bass guitarists. The interactive practice sessions aim to encourage students to complete the program. The free lessons are categorized into three fundamental stages. This provides a step by step process which makes it easier for students to understand how the bass guitar works. At the end of the program, students are expected to understand music theory, strumming, tuning, and playing the power chords with the bass guitar. Other aspects that covered in the online course include playing the bass guitar by ear, improvisation, and improving harmony. The content on this website is regularly refreshed to provide useful content at all times to visitors and students. After the basics, students are introduced to other areas such as learning the bass frequency range and chorus settings, introduction to sound, the grace notes, and how to combine the hammer-Ons and pull-offs. The pre-recorded videos are of high-quality and useful to guide the students on the website. Online guidance is also available by interacting directly with the instructors. This website offers beginner lessons, and advanced bass guitar lessons online. These lessons are free. The course outline covers crucial areas such as learning how to hold and pluck the bass guitar. There are also lessons about major and minor bass scales and how to use the fret board. After learning the basics, students can go further to study and practice bass guitar lessons about the pentatonic scales, blues bass lessons and how to maintain a fluent tune while playing the bass guitar by ear. The lessons are all compiled and uploaded to YouTube for free. The lessons on this website have been prepared and packaged by Scott Noftle. He is a professional bass guitarist who has had about twenty years of experience. He dedicated his time to creating these free lessons to make everyone who desires to become a bass guitarist achieve their dreams. Scott’s experience as a bass guitarist was identified as the reason he was able to create special lessons that have been simplified. This means even people who haven’t played the bass guitar before can benefit from the online lessons. The content on the site is regularly updated with new lessons. The website is stable, and the videos run smoothly. This website offers a variety of focus areas beginners and intermediate bass guitarists can start. The website has a simple and friendly design. It is easy to navigate through the pages to find useful information about the online bass guitar lessons. Visitors can choose to start with the beginner songs or start an intensive practice session to improve their bass guitar techniques. A practical approach has been used to improve the lessons on this site. Students start by learning the arpeggios and how to play the scales. There are lots of free materials on the website. Students can also spend time learning about the bass guitar by reading insightful articles on the site. The owner of this website is Paul Wolfe. He is also responsible for preparing the online lessons. New students can start learning the free content to find a starting point. After learning the basics, they proceed to start practicing and playing songs with the bass guitar. The focus of the website is to concentrate on teaching students how to play songs. This is achieved through the online course that integrates practical training and music theory. The simple guide on the website is easy to use, and it gets beginners started the right way. On the website, you can start your online bass guitar lessons by clicking the ‘start here’ menu. There are lots of free tools and information on the site. Students can learn how to use the fret board through a free course and also practice jamming. To get access to premium content, you will have to register on the site. 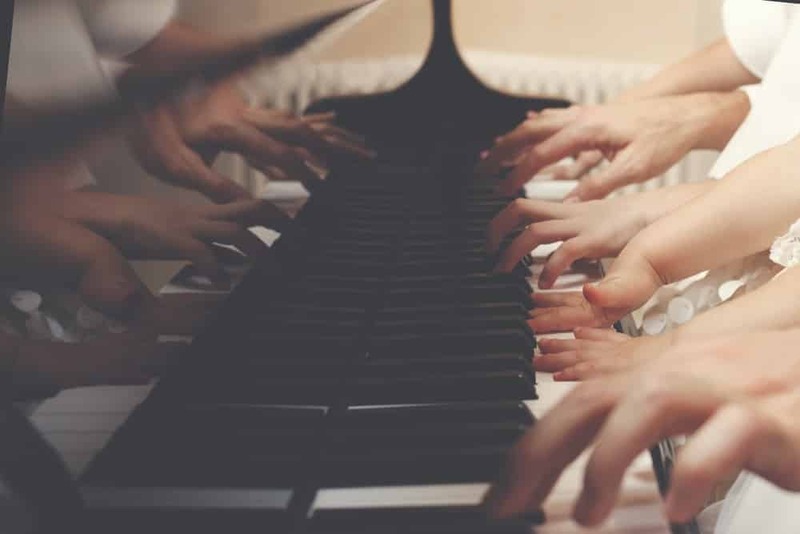 As a member, you have unlimited access to the free courses such as music theory, learning how to tune the bass guitar, and practicing the best techniques. Every visitor is invited to download the free book on playing the bass guitar. The website has a blog. Here students and visitors to read interesting posts related to the bass guitar. The blogs are created to guide and educate students about ways to improve their skills. The blog is frequently updated with new posts to keep visitors engaged and informed. The website is run and owned by an expert bass guitarist names Dan. He has had over fifteen years of experience as a guitarist and music teacher. On this website, students can also find valuable information that they can use to get more value as bass guitarists. For example, Dan blogs about different ways to find and secure good gigs, how to read charts, reviews, and free tips to encourage the readers. The bass guitar lessons on this website can be accessed directly by signing up or starting with the free three-day trial. This is an introductory course that involves playing the bass guitar to give the student an idea of the course outline. The lessons are enhanced with interactive features to make them fun and engaging. Students can view the free lessons on YouTube. They have been created to be HD videos which are easy to study with good audio. The website is also a source of useful tips and hints to improve strumming, picking the chords, learning notes, and playing songs by ear. Daric Bennet shares his exclusive tips on bass guitar soloing to help students interested in this aspect. In addition, students who have learned the basics about the bass guitar can proceed to other lessons. Bennet reveals his techniques through tips and licks; he shows how to perform the shuffle bass groove. 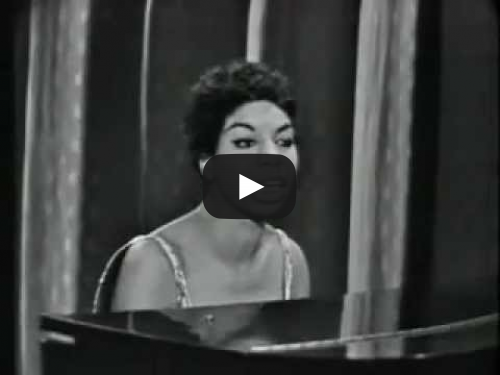 Students also have access to videos about the riff and how to play along with the modes. The lessons are all free. The website is of a high-quality and easy to use. Students can have their first experience playing the bass guitar by following the instructions on this website. 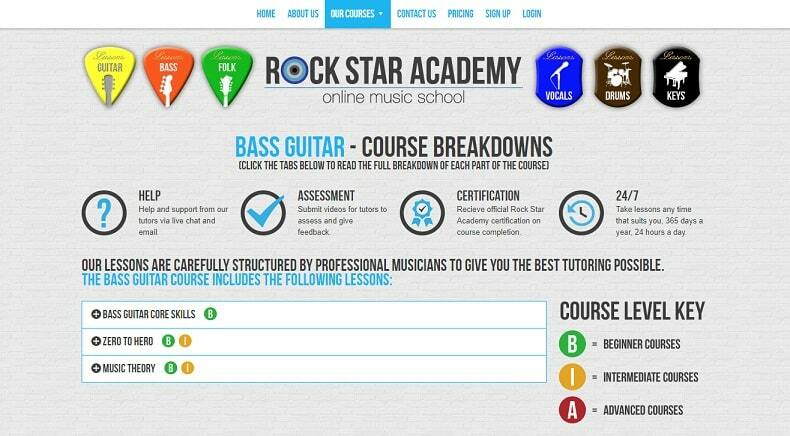 RockStar online academy is a good place to start your journey to become a bass guitarist. The website features a simple guide to get started as a beginner or intermediate bass guitarist. On the website, the course outline indicates the lessons are a mix of practical sessions and music theory. 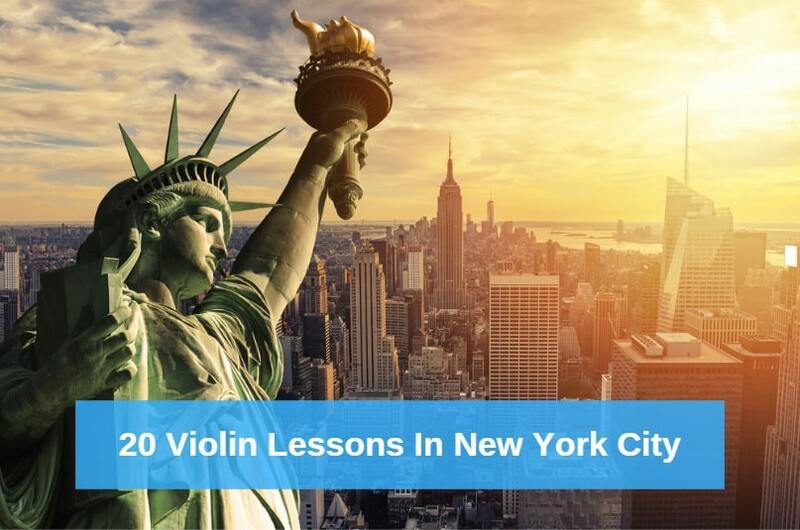 The lessons have also been particularly tailored to beginners and intermediate students. Everyone, even the children can benefit from the bass guitar online lessons presented on this website. After learning the basics, students are given access to hundreds of learning materials to aid practice. Students are also free to upload pre-recorded practice sessions which are reviewed by the instructors. The lessons on this website are available at all times. Students from all over the world can also start their courses at any time of the year. The lessons have been prepared by professional bass guitarists who have extensive experience as music teachers. After learning the core skills and passing the tests, students are awarded a certification from the RockStar academy to confirm they have completed the online course. This is a website that offers a series of online bass guitar lessons. A visit to the site shows the different lessons that can be accessed by students. The lessons have been described and the instructor's name indicated for recognition. On this site, intermediate bass guitarists can find so much information to improve their techniques. However, there are some courses offered for beginners. In no particular order, students can select their preferred lessons to begin. This is done regarding particular bass guitar techniques that the students are interested in learning. There are lessons that teach plucking techniques, how to improvise and progressions techniques, the left-hand technique, string muting and warm up practices. The instructors on the website are professional bass guitarists. The lessons are presented as high-quality videos files. There are over one hundred lessons on the website. To gain access, students are required to sign-up on the site and create a profile. There is also an active online forum where students and instructors interact to share knowledge and tips regarding playing the bass guitar. Students also have access to the licks which are presented daily to encourage regular visits. In addition, there are online workshops where students get an opportunity to interact with the instructors. This is such a simple and friendly website. The lessons are properly described so potential students can understand the value they will get. The lessons are also targeted. However, all students can decide when they wish to learn and how their lessons can be structured for convenience. Busy people can take advantage of this structure to learn how to play the bass guitar at their pace. The lessons are created and presented as DVD files, live video streaming, and files for download. The content includes lessons on how to hold the bass guitar, strumming techniques, the left-hand technique, how to practice plucking and string muting during play. The direct approach of these lessons encourages students to start playing songs shortly after learning the basics. All of the learning materials on this website can be purchased directly online. Students can also choose which content they wish to learn. Experienced bass guitarists can also visit the site in search of particular lessons they need to improve their bass guitar techniques. The website is easy to use; visitors are encouraged to listen to some practical tips and online content. This experience reveals what they can learn by using the content from the site. This is a website which offers paid bass guitar online lessons. On the site, the lessons have been structured to cover all the essential aspects of playing the bass guitar. The lessons are tailored to everyone from beginners, intermediate students, and more experienced guitarists. The lessons have been well defined on the website. They can also be purchased independently which is cost effective. This offer also makes it easy for students to learn at their pace. The lessons have been arranged to ensure students do not skip important lessons before proceeding to the next level. The website features a high-quality lesson map which is presented to visitors for free. This map shows students the path their online lessons will follow. It is a step by step process to guide the students through the different learning levels. 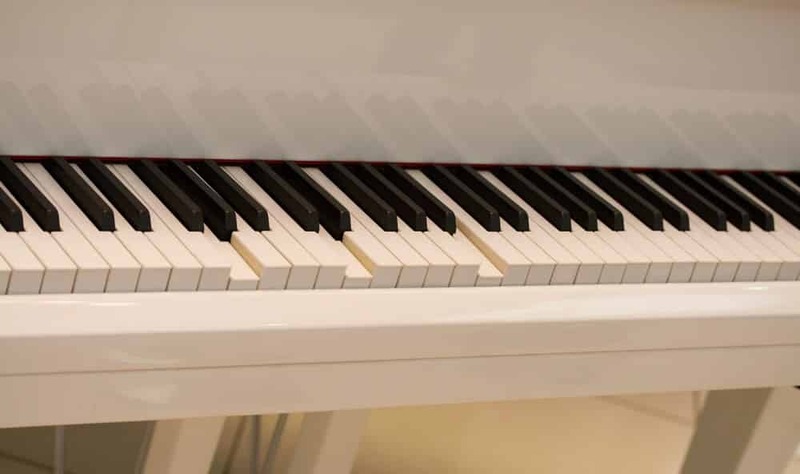 The lessons generally cover areas such as improvisation, songs, and repertoire, reading music, learning about the chords, gear reviews, and many more. There are also articles posted on the website. These posts cover topics such as how to buy a new bass guitar, discussions on music theory and other related topics. This is one of the popular websites where people who wish to become bass guitarists can find competent teachers. There are over fifty profiles of teachers on this site. They are always available to teach students everything about playing the bass guitar. On the website, you can find bass guitarists with many years of experience who have prepared easy to use lectures. By following their instructions, you can teach yourself how to play the bass guitar right from the comfort of your home. The lessons last for about thirty minutes per session. Selecting the right teacher on the Lesson Face website is easy. The teachers have entered useful information on their profiles. This way, the students can find out if the lessons offered by a particular teacher are in line with what they plan to achieve. 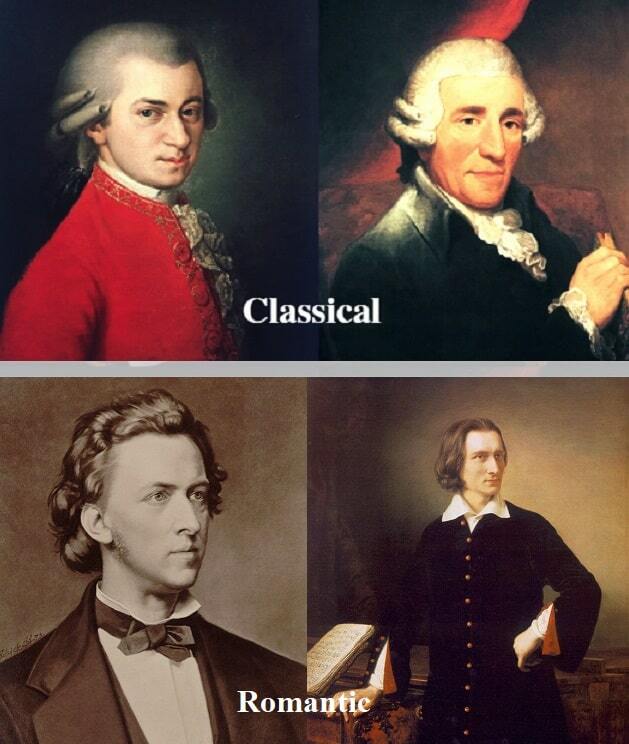 Many of the teachers on the website have been through the university where they studied music. They also offer bass guitar lessons for all levels. Students also have the opportunity to book trial lessons before purchasing the complete course. The teachers on the website have also been rated by past students. Hence, teachers can be selected based on their five-star rating. 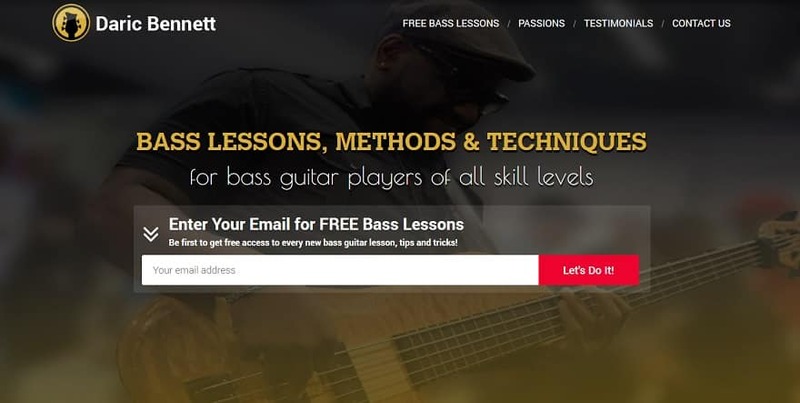 This is one of the online academies that offer bass guitar lessons. The instructors on the website have been vetted to ascertain their qualification as bass guitar teachers. There are over fifty teachers to choose from at all times. The lessons are usually presented as pre-recorded videos. They must be of high-quality to meet the standards of the website. Students can also book for private lessons that are organized via live streaming applications. The lessons last for an average of thirty minutes each. The teachers also have badges to show their level of accomplishment on the website. To get started, the student is expected to register an account. Their details may need to be confirmed according to the rules of the website. Communication with the teachers can commence before purchasing the lessons. Students can find out specific information about the lessons before payment is made. The website is reliable, and the reviews indicate that some students have had a good experience on the website. On Preply, people from all over the world can find bass guitar teachers online. The website has a good design and responsive features. 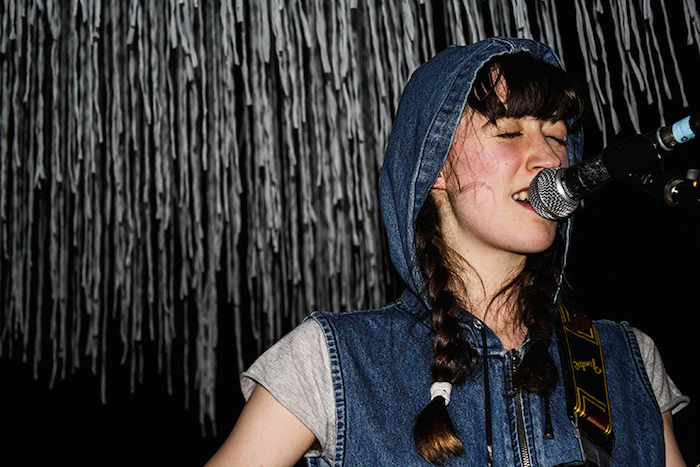 The lessons cover basic areas such as postural guidance, learning the chords, how to pluck the bass guitar and string muting techniques. You can also find teachers who are experts in using the left-hand technique to play the bass guitar brilliantly. The lessons are created and sent as video files via email or through the platform. This is also one of the few online academies where students can find music teachers who speak their native language. Considering the fact that learning can be easier when the communication is fluent, teachers indicate their spoken languages. This also means students from all over the world can achieve their dreams of becoming expert bass guitarists by finding the right teachers. The lessons on this site are charged by the hour. Students can have more control over their time by scheduling lessons at their convenience. Before choosing a service, students are permitted to book trial lessons to know if the teacher’s methods will be adequate to achieve their goals. This website attracts professionals from all parts of the world to offer online bass guitar lessons. 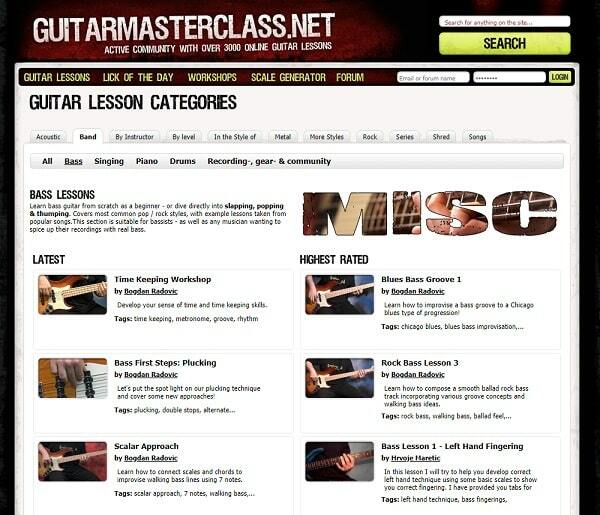 The offered lessons are mainly tailored to meet the needs of intermediary bass guitarists who need to improve their techniques. Students who are preparing for examinations can also take advantage of these online lessons. 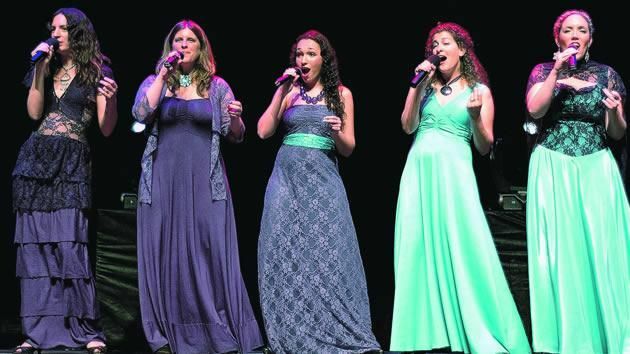 They are also adequate for people who need to perform better during auditions to join bands or other musical groups. The teachers have all created their profiles on the website. They discuss the features of their lessons and how the course has been developed to help their students. Many teachers offer exclusive insights which reveal tips and tricks they have used to improve their skills over the years personally. 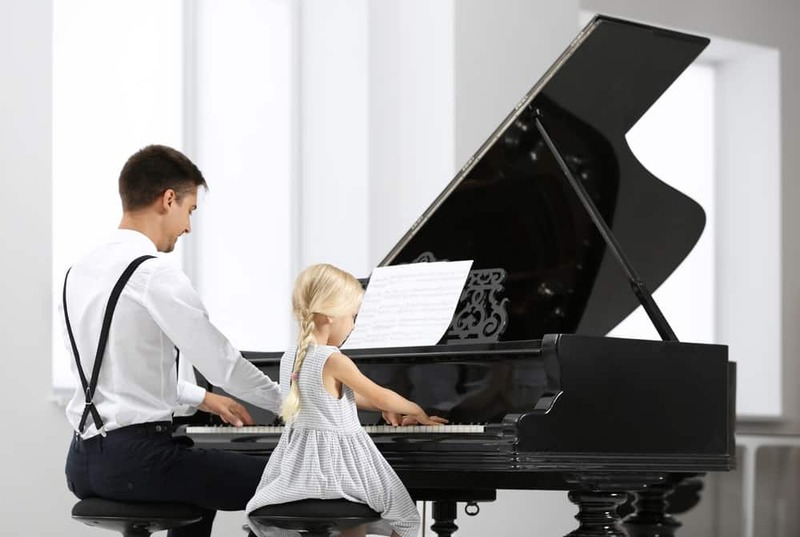 The online lessons are usually a mix of practical lessons and music theory. They are presented as video files, with options to organize private lessons which can be done live on Skype. It is a great website, easy to use and the features make it easy to navigate. Students can also search for teachers based on their preferred language. 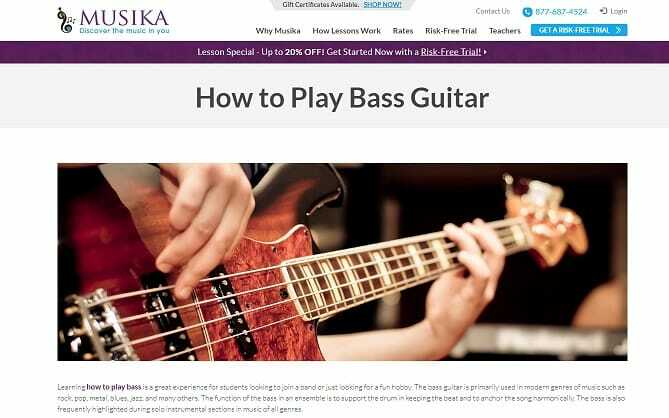 Musika is one of the popular websites that connect music teachers to students. In this case, finding a suitable bass guitar teacher online is now easier. The website accommodates students who wish to start learning how to play the bass guitar at different levels. On the website, students can search for teachers based on their states in the US. The teachers have been vetted and confirmed to possess the qualities needed to provide guidance and instructions regarding playing the bass guitar. The lessons are also organized in simple structured forms to help students learn through a step by step approach. 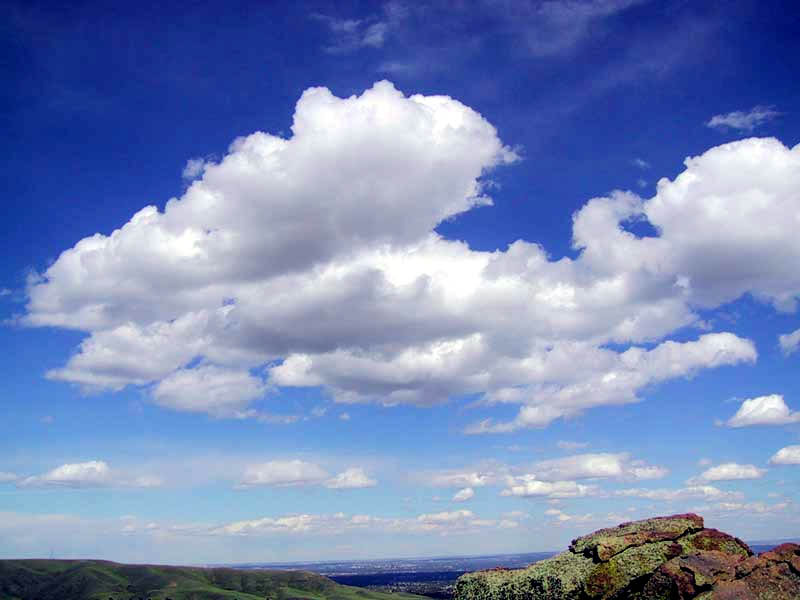 To get started, students are encouraged to begin with the free trial lessons. These are introductory lessons that give the students an insight into the complete course. The lessons are for students who are preparing for exams or auditions. People who wish to become bass guitarists as a hobby can also sign up to receive the lessons online. 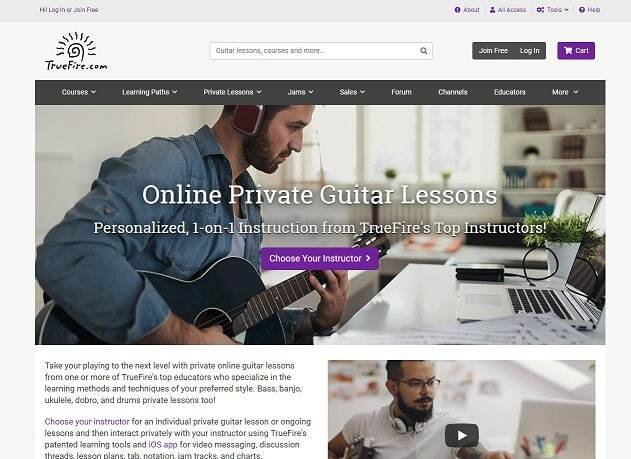 This website offers online private lessons to all students. It is the ideal choice for busy people who will like to plan specific times to receive these lectures at their convenience. These private lectures are also good for others who need customized lessons to help them achieve their dreams of becoming bass guitarists. New students are given a 25% discount when they purchase the first lesson. The interactive sessions enable students to inquire about the teacher's lectures. Students can also identify and choose particular areas they wish to focus on during the course. The lessons are for beginners who have never played the bass guitar before and intermediate bass guitarists who wish to enhance their techniques. During the individual lessons, students can record their practice sessions and upload the videos for a review by the instructors. The lessons can also be scheduled via the app which is compatible with iOS devices. The learning process on the website is done through a combination of live video streaming, discussion threads, and tailored lesson plans. It is however important that the student has good internet connectivity to ensure the course continues smoothly. This is one of the biggest websites to find online bass guitar teachers. 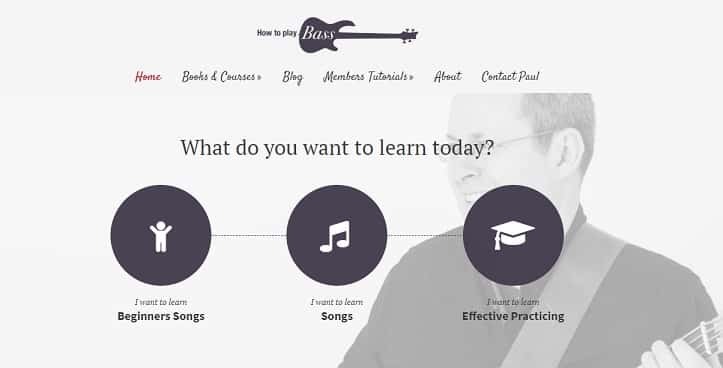 There are over eight hundred teachers who have prepared lectures, tips, and other learning materials for aspiring bass guitarists. 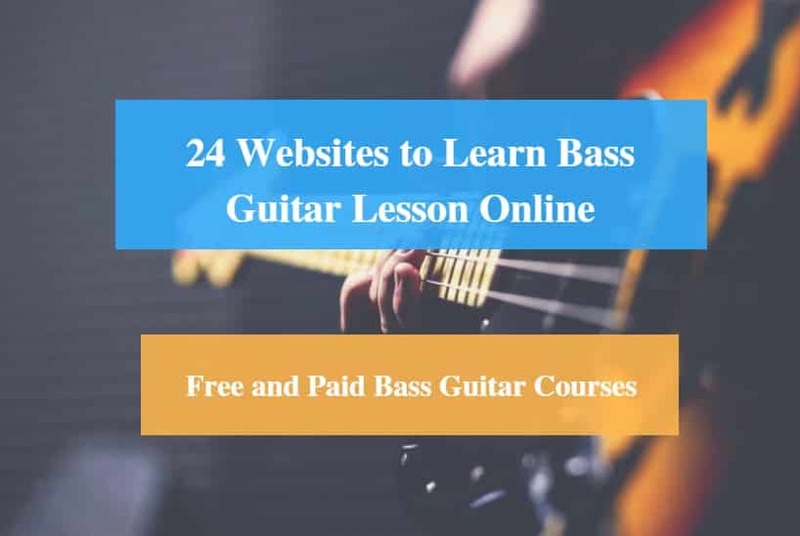 Many of the teachers on this website have obtained their degrees from universities, so the expected value of the online bass guitar lessons is high. You can also find teachers who have specially prepared lectures and guidelines to help students preparing for examinations or special auditions. After communicating with the teachers, lectures can be tailored to meet the specific needs of the students. The timing is also flexible. The teachers are more interested in offering a step by step approach to help the student understand everything about playing the bass guitar. There are over fifty teachers with active profiles on this website. You can find teachers who offer free lessons and other discounts after purchasing their lessons. Students can pay for the services per hour. It is, therefore, easier to plan and create time for the lectures. The teachers on the website have also been rated on a five-star scale. This makes it easier for students to buy from teachers who have helped other students in the past and earned five stars. 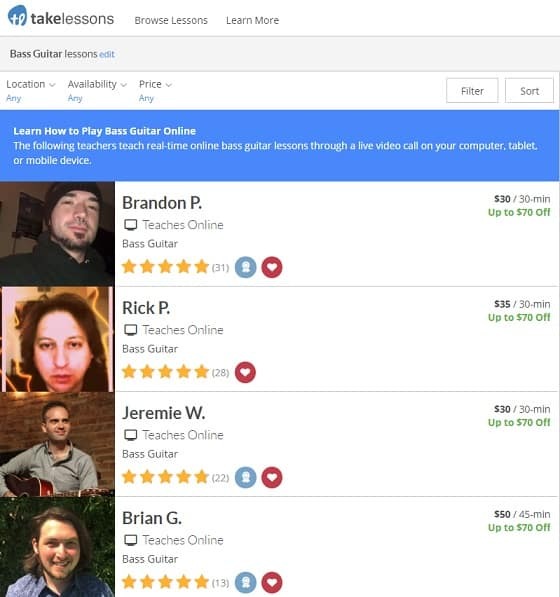 On this website over one hundred bass teachers have created profiles to advertise their online bass guitar lessons. You can find teachers who have prepared particular lessons for beginners who would like to start from the first lessons. There are also many opportunities for intermediate and experienced bass guitarists to learn from the experts. The lessons are mainly offered as pre-recorded videos which instruct the students on how to improve their techniques while playing the bass guitar. It is also a reliable website to find music teachers who can help students prepare for exams. Many of the lessons are designed to help students overcome some of the common issues people encounter when learning how to play the bass guitar for the first time. On the website, the lessons are charged per hour. The profiles also indicate the number of hours each teacher has taught on the site. They have also been rated by past students based on a five-star rating. This information can help students identify the most suitable teachers who can help them become expert bass guitarists. Each teacher has also indicated the subjects they offer to guide students who visit the site in search of bass guitar teachers. The website is responsive and easy to navigate. It is a good option for students who are looking for university schooled bass guitarists to learn from through a convenient system. Many of the online bass guitar lessons have been designes to have flexible timing. This is suitable for the students who would like to practice and master previous lectures before proceeding to the next stage. Depending on the students’ needs, private lessons can be purchased. These exclusive lessons are more targeted, and the students have more opportunities to interact with the teachers online directly. When choosing online bass guitar lessons that require live streaming, it is important to make arrangements for reliable internet access. A fast connection will prevent the waste of time, frustration, the communication with the teacher will be better. The online bass guitar lessons are also adequate for students who are only interested in learning about particular techniques to improve their skills. This group of students can buy online lessons that are sold individually instead of purchasing bundles they do not need. Overall, the online bass guitar lessons can be used by people of all ages and from all global locations to become expert bass guitarists.